One of the benefits of the vast library of archives Vince McMahon owns is that there are some really good DVDs out there to relive the past. I'm a fool for old school, so whenever I have a chance to watch something from the 80's, I'll jump on it. Mostly because it's something that I watched as a kid/tween/teen and want to see how things use to be. Today as I was running on the treadmill with my "Best of Saturday Night's Main Event" DVD (thanks Chad) fired up, it really showed me the big differences between the mid to late 80's and the modern day product. Of course, that doesn't take a genius (not Lanny Poffo) to figure out. During today's workout session, I watched a best two out of three falls match between the Hart Foundation and the British Bulldogs. The Harts were the tag team champs. The Dogs won the first fall by DQ and the second by pinfall. Of course, that meant no title change. Another factor that made this match work (and the original point of this post) was the men calling the match. 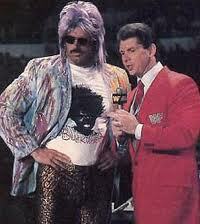 While I wasn't a big fan of Vince's work as a commentator, he and Jesse Ventura sold the fans the match in the ring. They did that every time. Yes, they'd argue with one another through the course of a match, but the focus was on the action INSIDE the ring. Not like today when we here about the matches coming up later. Or what's going to happen on the next pay per view. Honestly a lot of times, you can watch a match on Raw or SmackDown! with the volume down, because it's either Michael Cole kissing up to the Miz or someone hyping the next pay per view. The next match on the DVD was Honky Tonk Man vs. Randy Savage. The one where Elizabeth gets shoved down to the mat and brings Hulk Hogan out and the MegaPowers form. This time it was Bobby Heenan and Vince on the commentary. And again, they stayed focus on the task at hand. We didn't even hear Hulk Hogan's name until the man appeared on screen. Watch Raw tomorrow night and count how many times the Miz is mentioned without being on screen. Or Randy Orton or John Cena. I promise if you pay attention, and go back and watch some vintage (sorry Cole haters) WWF footage you'll see the difference too. Maybe this is just another Capt. Obvious post, but it's something that I guess I forgot about until watching some classic footage. I understand it's a bigger business now and self promotion is the best way to get yourself over, (I'm quoting him again) as Gorilla Monsoon would say "Give me a break!"